It's getting a little late to still be sharing holiday highlights (like this and this), but I couldn't miss sharing some of the fruits of my op shopping along the way. I am feeling particularly inspired and vindicated in my hoarding now thanks to a wonderful little blog called A Collection a Day, 2010, discovered via the Likkle Girl (creator of The Empress Dowager's New Jewels that I have raved about before), who has also been sharing the fruits of recent op shopping on her blog. It's well known that country op shops can often yield the best results. However sometimes it seems a little too well known, when it turns out that the owners of the op shops have worked out there's a fortune to be made from passing city slickers (i.e. Milton, where I picked up the polka dot jars snapped below), in which case there might be great stuff but not so many bargains. In other cases, during holiday times it often seems the stores have already been pillaged. So, I've found the secret is therefore to go for places way out of the way when the opportunity presents itself, which is what we did on the way back, when we took the back roads from Beechworth through to the Snowy Mountains. Not only were we not on the main highway, but a lot of the little towns we stopped in at were not even on the main back-road. In some ways it was a little depressing, as these towns unfortunately don't have much life left in them, but I cheered up with a few good finds. I think Mr D was a bit worried about my hoarding habits, but he was happy to have another excuse to meander through the countryside, and in the end very impressed with my acquisitions. 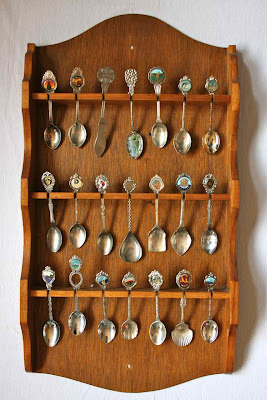 My absolute favourite find was the spoon collection pictured at the top of this post, and closer up below. As it happens, earlier during our holiday, we visited Mr D's grandfather where we admired a very similar collection he had on the wall. This one came fully stocked for the plum price of $4.00! 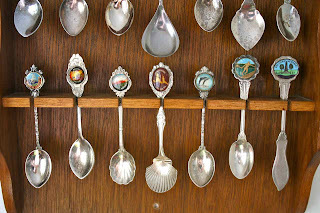 Most of the spoons are from Australian tourist spots, which makes it even more kitsch. I love it, and it's already hanging on the wall. Now, I know it will seem like I am being greedy and wanting to keep my treasure troves a secret, but I seriously can't remember the names of a couple of the little towns where I picked up some of these gems. I'm terrible like that, I need to write these things down! Anyway, one such little town took the cake. 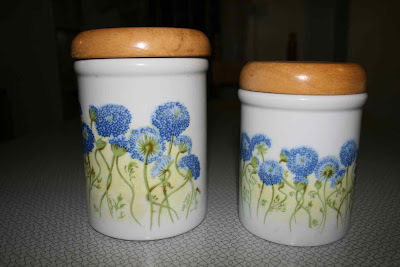 It was mostly clothes, and I didn't have too much time to rummage through them, but I found the two ceramic cannisters below. I took them up to the counter to ask the lady how much and she looked at the carefully before advising "20 cents, each". Seriously. Love it. Goulburn turned out to be a gem. 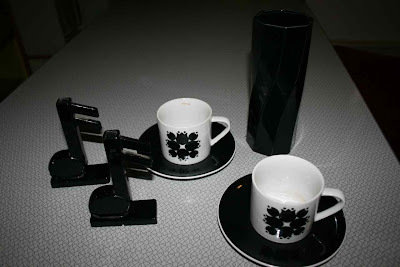 Mr D managed to pick up a few good records in one place along with a quirky little collection of black and white china (see snap below), including two very cool little musical note vases, and a couple of Japanese tea cups. We've already got quite a collection of Japanese china... another day another post. 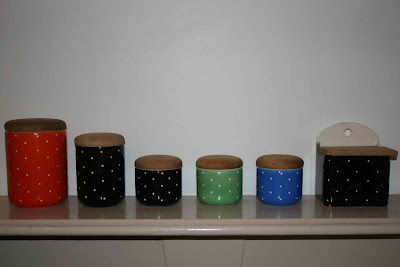 I think my next op shop adventure might have to be for new shelves to show it all off in our new home in Melbourne. WOW, Phoebe! What amazing finds! The complete spoon display for 4 bucks?!!!! Wow!